Gemstones have been part of history since ancient times; their beauty has captivated kings, pharaohs, emperors and everything in between. Fast forward to today and the beauty of gemstones, continue to fascinate us but how does a gem become so beautiful? There are many steps necessary to facet a stone from its rough form to its beautiful finalized form. This series of blog posts are focusing on each step of the faceting process. Today we begin with the first step in the process. Step One: Selecting the rough. 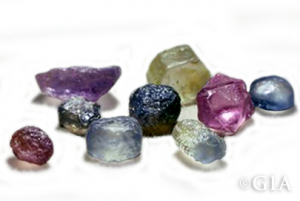 Rough is the term used to describe the gemstone that has not yet been polished or cut. 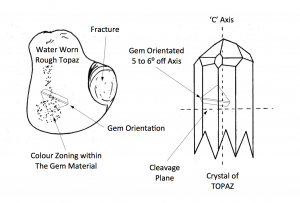 All gems have unique crystal structures that determine the way they grow and can affect the shape that they will be polished into. When choosing rough, these three factors are essential: clarity, color, and cleavage. Sapphire rough, pictures courtesy of GIA. 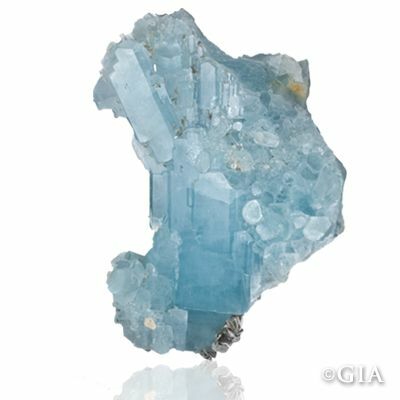 Aquamarine rough, pictures courtesy of GIA. 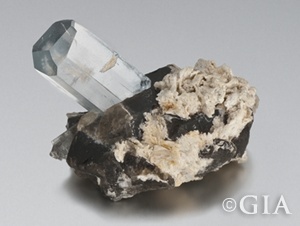 Topaz rough, pictures courtesy of GIA. The clarity or the clearness of the stone is determined by the amount of inclusions, cracks or other minerals within the stone. To be able to decide on the clarity, gem cutters utilize oils or liquids that can help them see inside the crystal from the outside, just like a window. Under at least ten power magnification, gem cutters then look for any factors that might affect the clarity or become a potential threat to the structure of the finalized piece. The goal is to find a stone that does not contain a lot of inclusions. Which is easier said than done. The art of faceting a stone allows for the cutter to find and analyze the best way to deal with any inclusions in the stone. 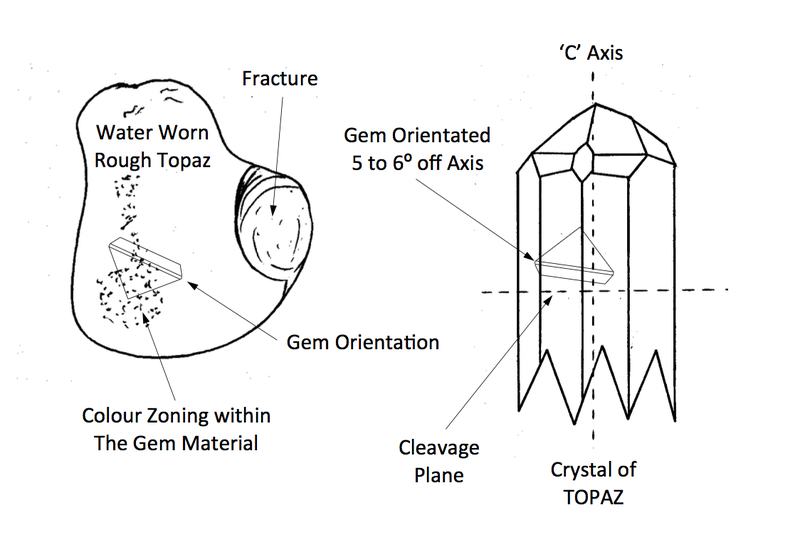 Once the clarity is analyzed, the orientation of cutting gets mapped out for the maximum recovery of stone weight. A wrong decision in the cutting orientation can be costly and could even cause a complete discard of the rough. The next step is color, which is the most critical value factor of this entire process of choosing a rough crystal.The term color zoning refers to the uneven distribution of color within a gemstone. Which leads to a question is the color uniform through the entire rough? Is it lighter one side more than the other? 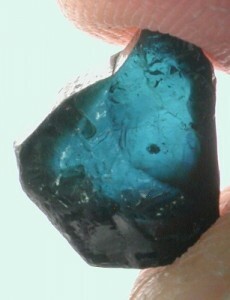 Many stones contain more than one band of color, is essential to orient the banded rough so that the pavilion (bottom part of a faceted gemstone) is entirely within the banding when is cut. The pavilion must not protrude past the color zone point, to avoid a loss of the desired color. Cleavage – The tendency of a mineral to break along flat planar surfaces as determined by the structure of its crystal lattice. These two-dimensional surfaces are known as cleavage planes and are caused by the alignment of weaker bonds between atoms in the crystal lattice. The cleavage planes will help orient the stone to the angles needed to prevent the stone from chipping. Now we know the basics of picking rough, is a skill that takes time to develop. Remember that practice makes perfect! In our next post, we will begin to identify the parts needed to polish the rough into a beautifully polished gem. I've been a customer here for over a decade. They offer beautiful ready-made jewelry along with custom services. I've had a few custom pieces made, a topaz ring and a pair of heart-shaped garnet earrings, and the process has been informative and resulted in lovely pieces. The staff is very welcoming without being overbearing, and will happily educate customers without being patronizing. Truly a great place to buy and repair jewelry and watches. Best jewelry store I have ever had the pleasure to work with. They were able to help me narrow down what I really wanted and gave me really fair and good pricing. The atmosphere is amazing as well as the people who work there. Extremely professional and able to answer so many of my questions. Absolutely love that they are a faith based store. Will gladly do future business with them. I went in for a ring appraisal. The customer service as top notch none the less. Every person was warm and inviting and willing to help. They were genuinely interested in providing you with what you came in for. I definitely recommend as their knowledge of jewelry was very evident. © Copyright 2019 Royal Diadem Jewelers, LLC.